Everyone needs a haircut once in awhile, even if it is just a trim. 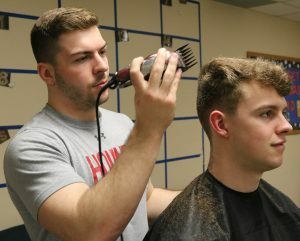 Some students come to the University of Indianapolis without a car, or they might not be able to find time to drive off campus, so getting a haircut may be difficult. For freshman nursing major Dylan Hinton, this is how he began cutting hair for his friends on campus. Freshman nursing major Dylan Hinton gives freshman exercise science major Adler Chamberlin a haircut in the basement of Warren Hall. Hinton also cuts his teammates hair. 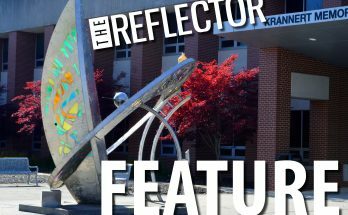 Hinton began to cut hair approximately halfway through the first semester of the 2018-19 academic year. Because Hinton is on the wrestling team, he said he gives haircuts to most of his teammates. Hinton lives in Warren Hall and does his work in the lobby of the basement so a lot of the men who come to him also live in Warren. When he began his barber service, Hinton said he did not know much about what he was doing, but that he made an educated guess. After receiving a few tips from his own barber, Hinton said he took that advice to better his work. To hone in on his craft, Hinton said he also began watching YouTube videos and reading books to further understand how to properly cut hair. Through practice and research, he said that his skills have improved quite a bit. 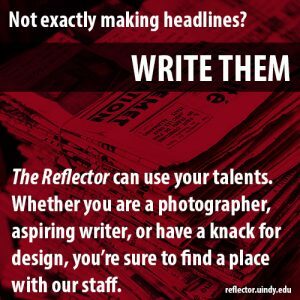 Hinton said he has always been an artistic person, but when he got to UIndy he did not have an outlet for his inner artist. Hinton said that he created an Instagram page and coined himself the UIndy Barber, which has lead to inquiries from all over campus. He said he now sees an average of five to seven people a week for haircuts, and all of these cuts are done by donation. Hinton not only cuts hair, but he trims beards and does eyebrows as well. Like Hinton, freshman entrepreneurship major Julian Cavallo also has his own barber service. He does his work out of the laundry room in Cravens Hall. As a member on the track team, many of his haircuts are for his fellow teammates of the track team, similar to Hinton. Cavallo said he also cuts hair for a large amount of the football team and residents of Cravens Hall. He said that he began cutting hair in August before he came to UIndy, and he brought business cards to pass out around campus. Cavallo said the number of haircuts he does a week varies depending on his schedule. Like Hinton, Cavallo said he also learned how to cut hair by watching YouTube videos, as well as by practicing. Cavallo said with his busy schedule, he figured this could be a way for him to make some money from the donations that he receives. To get to know his clients more, Cavallo said he tends to have friendly conversations with them while he cuts their hair. Cavallo said he can do anything that the person wants in terms of cutting hair, trimming beards, mustaches and eyebrows. Students at UIndy, like freshman biology major Jarred Horne, have gone to both Hinton and Cavallo in recent months for the first time. Horne said that he was not worried about receiving a haircut from these two men like he would be with any other non-professional, and they both did a good job. “I think it was the second time Julian had ever cut my hair, that was like my favorite haircut ever,” Horne said.